REPRESENTING SAN DIEGO IN Japan 2019. MORE INFO HEre! 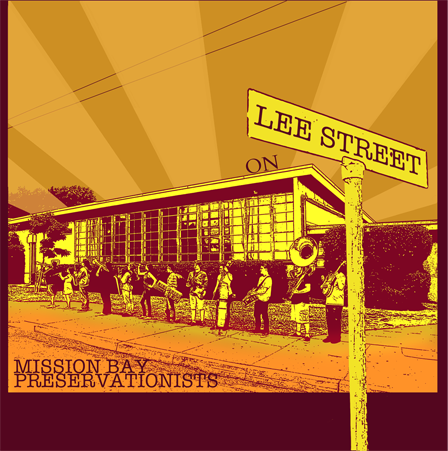 The Mission Bay Preservationists is one of the nation's premier traditional youth jazz bands. The band has been featured at venues throughout San Diego County and California including: House of Blues, Music Box, Dizzy's Jazz Club, Petco Park, Sea World, Ocean Beach Music and Art Festival, San Diego Jazz Party and the Sacramento Jazz Festival. The band's last four releases have been featured on two of the country's finest jazz radio stations, ("The Second Line Parade" with host Drew Miller) in San Diego and WWOZ ("The Traditional Hour" with host Keith Hill) in New Orleans. The band has traveled to New Orleans multiple times to perform at the New Orleans Jazz National Historical Park and the iconic Preservation Hall. In 2016 they had the honor of recording with New Orleans' legend, trumpeter Wendell Brunious, for the their 2016 release "Live in New Orleans". Their newest album “Louisiana Fairytale” (2017) features an all-star student line-up with guest artist Leonard Patton on vocals. This exciting, versatile group performs early New Orleans Jazz, blues, and swing. They are sponsored by America's Finest City Dixieland Jazz Society and are one of the featured youth bands at their annual Thanksgiving Jazz Festival. In April of 2017 the Preservationists traveled and represented San Diego in its sister city Yokohama, Japan to commemorate the sixtieth anniversary of sister city relations. This unique tribute offered an incredible experience that cultivated the cultural depth and professional horizons of our very capable young women and men as they prepared for the next chapter in their adult lives. Our students in the Preservationists are true professionals. They perform regularly on their own and in other performance groups throughout the city. We have had many of our students accepted into some of the finest musical schools in the country. Recently Eric Wesling (guitar - class of 2017) was awarded a $30,000 scholarship to Berklee School of Music in Boston. We are excited to help foster the next generation of jazz musicians in San Diego! The Mission Bay High School Jazz Ensemble was founded in 1974 by professional trumpeter and Mission Bay alumnus Rey Vinole. Through the decades Mr. Vinole built a program that would rival any big band in the state. They would take first place at numerous jazz festivals including the Orange Coast, La Jolla, South Western College and Corona Jazz Festivals, including soloist awards for their young talented musicians. The band was also invited to perform in Mexico City and Hawaii. Vinole was constantly reinventing the ensemble using different instrumentation not commonly found within the standard jazz big band such as flutes, clarinets, tubas and violins. This allowed any musician with talent to be apart of program. His love for music and dedication to his students led many of his musicians to careers in music including James Zollar, Brad Steinwey, Joey Carano, John Bodinger, Art Fischer and John Fattis. In 1975 Mission Bay High School even attracted the great Count Basie to perform at the school! In the mid 1980's Proposition 13 ended the funding for music in many elementary and middle schools. With a decrease in enrollment of musicians at the school and no longer able to fill his big band Vinole did what he does best and reinvented the Jazz Ensemble creating a new smaller ensemble, the Dixie Jazz Band. This smaller band would continue Mission Bay's tradition for excellence in jazz education and performance. In 2006, Mission Bay alumnus Jean-Paul Balmat (a student of Mr. Vinole's), took over the program and continued the preservation of traditional jazz at the school. In 2011 the Dixie Jazz Band evolved into what is now known as the Mission Bay Preservationists. In 2014 Balmat wanted to build on the success of the Preservationists and added the Mambo Orchestra. This additional jazz ensemble opened up a new genre of jazz and gave many more students the opportunity to express themselves. We will continue to make history at Mission Bay!